Thutmose IV (sometimes read as Thutmosis or Tuthmosis IV and meaning Thoth is Born) was the Eighth Pharaoh of the 18th dynasty of Egypt, who ruled in approximately the 14th century BC. His prenomen or royal name, Menkheperure, means "Established in forms is Re." Dating the beginning of the reign of Thutmose IV is difficult to do with certainty because he is several generations removed from the astronomical dates which are usually used to calculate Egyptian chronologies, and the debate over the proper interpretation of these observances has not been settled. Thutmose's grandfather Thutmose III almost certainly acceded the throne in either 1504 or 1479, based upon two lunar observances during his reign. After ruling for nearly 54 years, Amenhotep II, Thutmose IV's father, took the throne and ruled for at least 26 years, but has been assigned up to 35 years in some chronological reconstructions. The currently preferred reconstruction, after analyzing all this evidence, usually comes to an accession date around 1401 BC or 1400 BC for the beginning of Thutmose IV's reign. The length of his reign is not as clear as one would wish. He is usually given about nine or ten years of reign. Manetho credits him a reign of 9 years and 8 months. However, Manetho's other figures for the 18th dynasty are frequently assigned to the wrong kings or simply incorrect, so monumental evidence is also used to determine his reign length. Of all of Thutmose IV's dated monuments, three date to his first regnal year, one to his fourth, possibly one to his fifth, one to his sixth, two to his seventh, and one to his eighth. Two possible other dated objects, one dated to a Year 19 and another year 20, have been suggested as belonging to him, but neither have been accepted as dating to his reign. The reading of the king in these dates are today accepted as referring to the prenomen of Thutmose III - Menkheperre - and not Menkheperure Thutmose IV himself. Due to the absence of higher dates for Thutmose IV after his Year 8 Konosso stela, Manetho's figures here are usually accepted. There were once chronological reconstructions which gave him a reign as long as 34-35 years. Today, however, most scholars ascribe give him a 10 year reign from 1401 to 1391 BC, within a small margin of error. Thutmose IV was born to Amenhotep II and Tiaa but was not actually the crown prince and Amenhotep II's chosen successor to the throne. 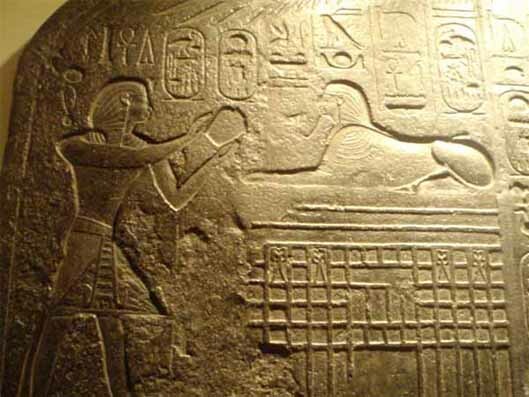 Some scholars speculate that Thutmose ousted his older brother in order to usurp power and then commissioned the Dream Stele in order to justify his unexpected kingship. Tuthmosis IV's name means, 'Born of the God Thoth' His throne name was Men-kheperu-re, meaning 'Everlasting are the Manifestations of Re'. 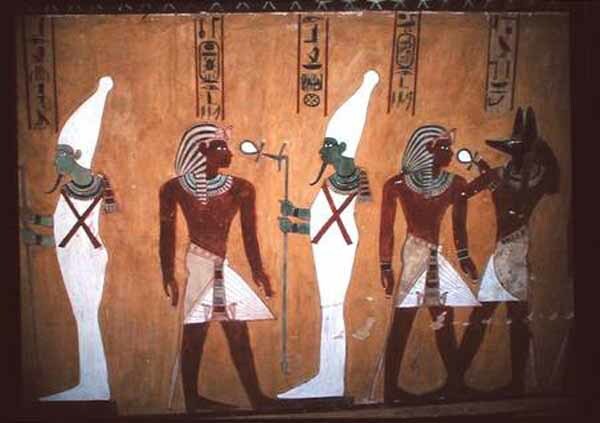 We can also find references to him under the names of Thuthmose IV, Thutmosis IV, and Djehutymes IV. 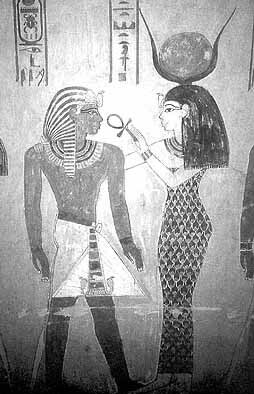 Tuthmosis IV was probably married to Mutemwiya, who produced his heir to the throne, Amenhotep III, though he never acknowledged her as either a major or minor queen. It is possible, though now doubted by some, that she was the daughter of he Mitannian king, Artatama, who sent his daughter to the Egyptian court as part of a diplomatic exchange. 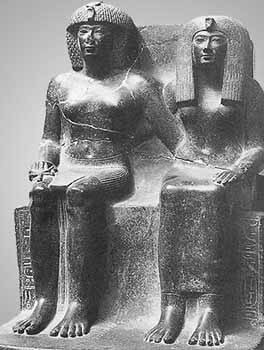 Other wives included Merytra, who we believe later changed her name to Tiaa (same as his mother's name) and a non-royal wife, Nefertiry. He probably also married one of his sisters named Iaret. Thutmose's most celebrated accomplishment was the restoration of the Sphinx at Giza and subsequent commission of the Dream Stele that can still be found today between the paws of the great Sphinx at Giza. Dreams were important in ancient Egypt and were considered to be divine predictions of the future. Now the statue of the very great Khepri (the Great Sphinx) resting in this place, great of fame, sacred of respect, the shade of Ra resting on him. Memphis and every city on its two sides came to him, their arms in adoration to his face, bearing great offerings for his ka. One of these days it happened that price Tuthmosis came traveling at the time of midday. He rested in the shadow of the great god. (Sleep and) dream (took possession of me) at the moment the sun was at zenith. Then he found the majesty of this noble god speaking from his own mouth like a father speaks to his son, and saying, 'Look at me, observe me, my son Tuthmosis. I am your father, Horemakhet-Khepri-Ra-Atum. I shall give to you the kingship upon the land before the living. Behold, my condition is like one in illness, all my limbs being ruined. The sandof the desert, upon which I used to be, now confronts me; and it is in order to cause that you do what is in my heart that I have waited. According to Thutmose's account on the Dream Stele, while the young prince was out on a hunting trip, he stopped to rest under the head of the Sphinx, which was buried up to the neck in sand. 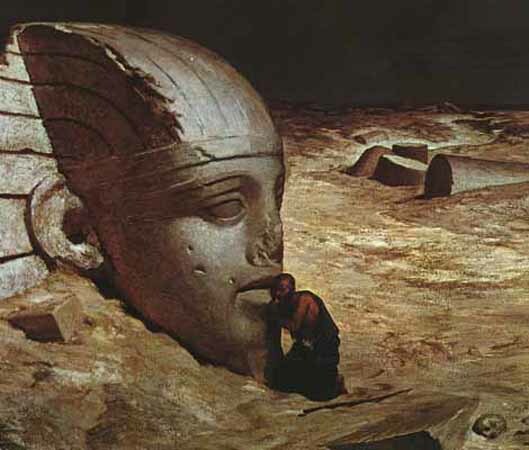 He soon fell asleep and had a dream in which the Sphinx told him that if he cleared away the sand and restored it he would become the next Pharaoh. After completing the restoration of the Sphinx, he placed a carved stone tablet, now known as the Dream Stele, between the two paws of the Sphinx.The restoration of the Sphinx and the text of the Dream Stele would then be a piece of propaganda on Thutmose's part, meant to bestow legitimacy upon his unexpected kingship. Little is known about his brief ten-year rule. He suppressed a minor uprising in Nubia in his 8th year (attested in his Konosso stela) around 1393 BC and was referred to in a stela as the Conqueror of Syria, but little else has been pieced together about his military exploits. Betsy Bryan who penned a biography of Thutmose IV stresses that Thutmose IV's Konosso stela appears to refer to a minor desert patrol action on the part of the king's forces to protect certain gold-mine routes in Egypt's Eastern Desert from occasional attacks by the Nubians. Thutmose IV's rule is significant because he was the New Kingdom pharaoh who established peaceful relations with Mitanni and married a Mitannian princess to seal this new alliance. Thutmose IV's role in initiating contact with Egypt's former rival, Mitanni, is documented by Amarna letter EA 29 composed decades later by Tushratta, a Mittanian king who ruled during the reign of Akhenaten, Thutmose IV's grandson. Tuthmosis IV is not the best documented of Egyptian pharaohs. We actually know very little about him in comparison to others of this dynasty. Little military action appears to have occurred during his reign, although our knowledge may be marred by the lack of texts. We do know that there was a Nubian campaign in Year 8 of his rule, and that apparently there were also campaigns in Syria. However, even though the king is referred to twice as the 'conqueror of Syria' these may have actually been little more then policing actions, rather than full scale battles. Like most of the Thutmoside kings, he built on a grand scale. Thutmose IV completed the eastern obelisk first started by Thutmose III, which, at 32 m (105 ft), was the tallest obelisk ever erected in Egypt, at the Temple of Karnak. Thutmose IV called it the tekhen waty or 'unique obelisk.' It was transported to the grounds of the Circus Maximus in Rome by Emperor Constantius II in 357 AD and, later, "re-erected by Pope Sixtus V in 1588 at the Piazza San Giovanni" in the Vatican where it is today known as the 'Lateran Obelisk." 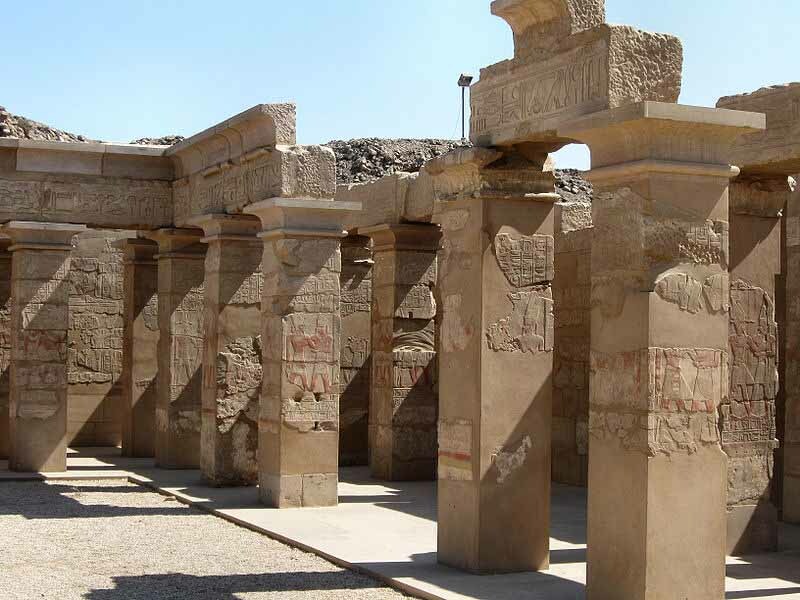 Thutmose IV also built a unique chapel and peristyle hall against the back or eastern walls of the main Karnak temple building. The chapel was intended "for people "who had no right of access to the main Karnak temple. It was a 'place of the ear' for the god Amun where the god could hear the prayers of the townspeople." This small alabaster chapel of Thutmose IV has today been carefully restored by French scholars from the Centre Franco-Egyptien D'Etude des Temple de Karnak (CFEETK) mission in Karnak. He also began work at most of Egypt's major temple sites and four sites in Nubia, but almost all of this was simply adding to existing monuments. Most of his work was adding to the temples of his father and grandfather, and perhaps suggesting new sites and monuments to his son. 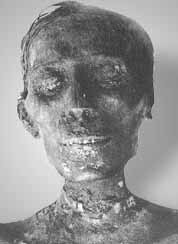 Thutmose IV was buried in the Valley of the Kings, in tomb KV43, but his body was later moved to the mummy cache in KV35, where it was discovered by Victor Loret in 1898. An examination of his body shows that he was very ill and had been wasting away for the final months of his life prior to his death. 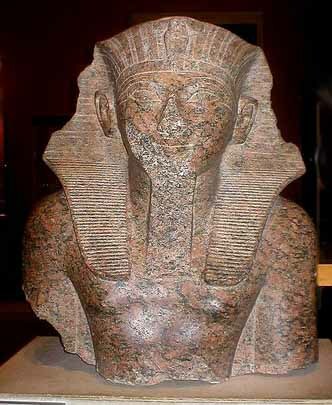 He was succeeded to the throne by his son, Amenhotep III. However, his mummy was missing from his tomb, having been found five years earlier in a cache of mummies located in the tomb of Amenhotep II. Perhaps better known are the fine private tombs built by his nobles on the West Bank at Luxor (ancient Thebes) in an area commonly referred to as the Tombs of the Nobles. These include such notable tombs as that of Nakht (TT 52) and Menna (TT 69). 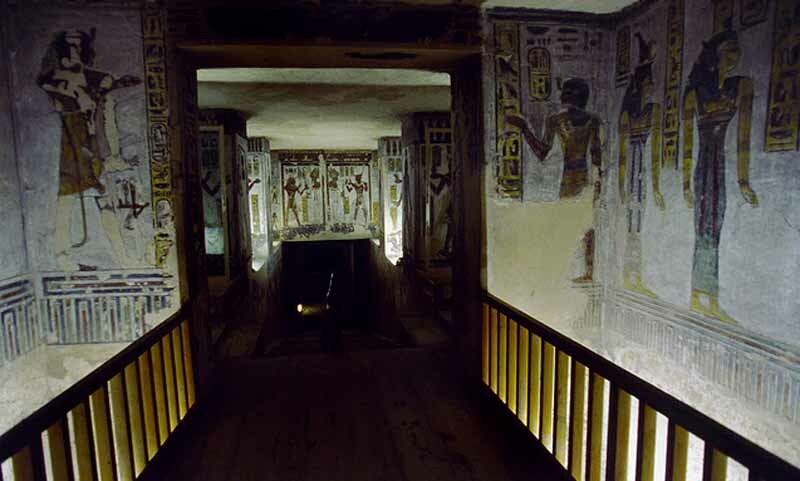 Howard Carter made the first modern entrance into the tomb of Tuthmosis IV (KV 43) on January 18th, 1903. This was not an accidental discovery by Carter, for he had been looking for this specific tomb. On February 3rd, it was formally opened. From the entrance we find a stairway leading to the first corridor, another stairway leading to a second stairway, which in turn leads directly to the ritual shaft. At the bottom of the ritual shaft is another single chamber. The ritual shaft opens directly into a two pillared hall. From the two pillared hall, the tomb takes a 90 degree left turn down another set of stairs to a third corridor, which leads to a final stairway and then an antechamber. The antechamber takes another 90 degree turn into the burial chamber, which has six pillars and four annexes, two on either side. Between the last two pillars of this chamber is a small stairway that leads to the crypt. Interestingly, while the tomb was carefully cut, the decorative plan of the tomb is virtually missing. Only the ritual shaft and the anteroom are painted, and these decorations appear to be hastily done. Both areas have ceiling with yellow stars on a dark blue background, and Khekher-friezes appear at the top of the decorated walls, which are painted a golden yellow. Also, in both of these locations, the king appears before various deities, and in each location these scenes are almost exactly the same, with the only material difference being the clothing of the deities. 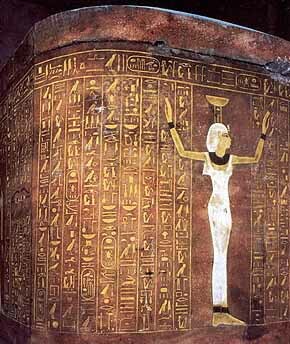 The Hieratic text found on the south wall of the antechamber was not created by Tuthmosis, but rather by Horemheb. It refers to the robbery during antiquity of this tomb, and Horemheb's efforts to restore the damage made necessary by the illicit entry. Hence, Tuthmosis IV's mummy was not found in this tomb but would later be discovered to be one of those found in the tomb of Amenophis II. While Tuthmosis IV's mummy was not found in his tomb, there were three subsidiary burials discovered, presumably offsprings of the king. Most all of the funerary equipment that was found was fragmentary.